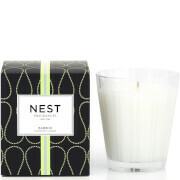 Infuse your home with an earthy aroma using the NEST Fragrances Tarragon and Ivy 3-Wick Candle; a large candle that arrives in luxurious NEST Fragrances packaging. The simple white candle is presented in a minimal, clear glass tumbler, which is able to complement and enhance any room in the home. Created with highly refined, cosmetic grade wax and fine fragrance oils, the 3-wick candle is renowned for its ability to infuse a room with fragrance. 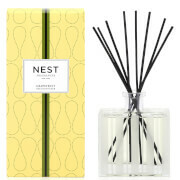 The Tarragon and Ivy scent evokes thoughts of a garden walk; combining notes of Wild Tarragon and Garden Ivy with fragrances of Tuscan Cypress and Cedar. 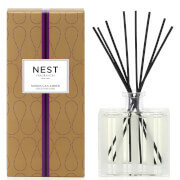 Expect an instant and long-lasting aroma that is invigorating and refreshing. Approximate Burn Time: 80-100 Hours.